The Common Core State Standards emphasize reading comprehension with deep understanding at an earlier level. Struggling readers will have difficulty meeting these standards without outside intervention. Under prior educational standards the focus in early grades, K-3, has been primarily on fluency and words per minute. The reasoning here was sound, as fluency requires decoding automaticity, a foundational skill for reading comprehension. In 4th and 5th grade the requirements moved to literal reading comprehension. Often, it was only at this point that reading inefficiency was detected. Children who appeared to be good readers — they could read fluently — lacked the ability to think while reading, i.e., reading comprehension skills did not develop as expected. Children in 1st and 2nd grade will now be required to comprehend text and make some conclusions about what they are reading. For example, they will need to be able to recognize the differing experiences of characters in the story, a distinction that requires a deep understanding of the main events and themes. By 4th grade, children will be required to describe a character in depth, using context in the story. They will also need to be able to extract the main themes from text. The Common Core State Standards call for broader literacy goals in other subjects, inserting “reading to learn” requirements, replacing some teacher instruction, to give children more exposure to reading, understanding and analyzing non-fiction. 1. Children will need to think while reading in 1st and 2nd grade. 2. Middle and high schoolers will need to “read to learn” — there will be less teacher instruction. The higher order, complex thinking skills that are the end goal of the Common Core State Standards will take time to nurture and develop. it is hoped that over time, schools will trim down their curriculum to allow more time for mastery of these critical lifelong learning skills. 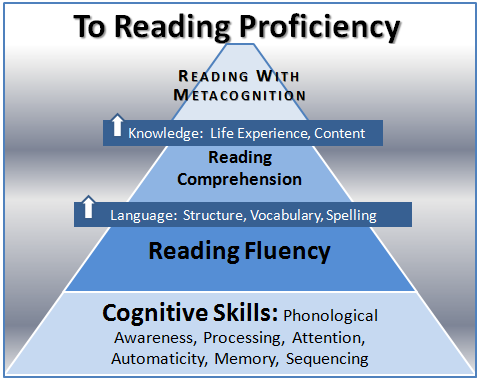 Cognitive and phonological exercises that build decoding automaticity — this creates a foundation for thinking while reading, as required for the Common Core, because the software focuses on the true, automatic reading fluency, not a work around that requires concentration. Categorization and other analytical exercises that help children learn to think while listening and think while reading from an early age. Reading comprehension exercises in the latter half of the program that promote higher level metacognition, the ability to self-correct while reading. Under the prior standards, many children were able to manage their way through reading into the 3rd and 4th grade using a variety of work around techniques. This will no longer be possible. If your child is unable to read and make connections from the text to their lives or to prior knowledge, this suggests a lack of understanding and an at-risk student. To find out if we can help, call for a free consult or ask your question here.